The most massive star known is R136a1. It is a Wolf-Rayet star with a mass about 265 times larger than the Sun. Such a star is more massive than the assumed upper limit for a traditional star, and it is not entirely clear how such large stars can form. The most popular view has been that such supermassive stars form when two large stars collide, but new observations cast doubt on that model. 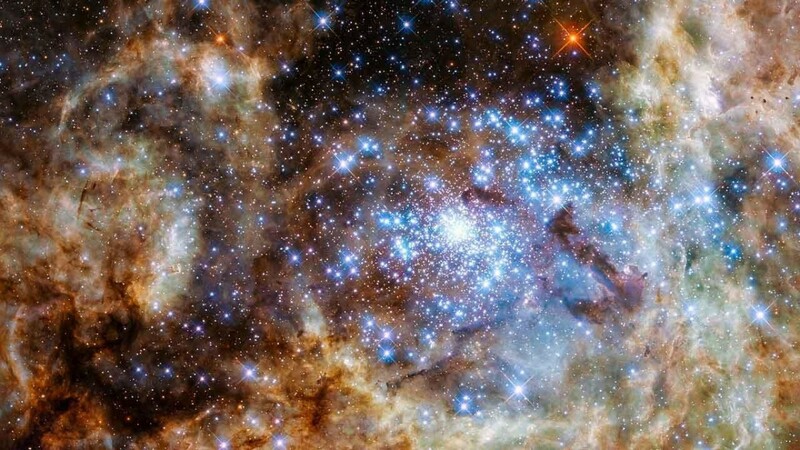 The largest known star is part of a cluster of stars known as R136, which is in the Large Magellanic Cloud. The cluster is only about 1.5 million years old, and has about 70 bright blue (O-type) stars. A recent ultraviolet survey of the cluster found 9 stars with masses greater than 100 solar masses. Given the cluster’s age, it’s extremely unlikely that 9 pairs of large stars would have merged within that time. The most massive stars in this cluster also have a bright emission line known as He II λ1640, and since the largest stars in the cluster are also the brightest, this emission line is prominent when the spectrum of the cluster stars are averaged together. This emission line also appears in another young star cluster in the galaxy known as NGC 3125. This would support the idea that the R136 cluster isn’t some unusual fluke. So young star clusters might form supermassive stars directly rather than through mergers. If that’s the case, we’ll have to develop new models to account for them. Now, I can only read the abstract of this paper, but I see from it that this is a low resolution survey. Makes me wonder how you can know for sure that objects that seem to be one star aren’t actually “dual core” or multi-core systems.